Exploring local streets, markets and temples in the day before going "home" to relax in an affordable villa. If that sounds like a good trip, you’ll like Bali. The Seminyak and Kuta areas of Bali are probably busier than you’d imagine if you’ve only seen those photos of tourists having remote beaches to themselves or swinging all alone over rice terraces. The Seminyak/Kuta/Denpasar area is clearly the city area of the island. While Bali is known for its private villas and resorts, tourist life is not all that separate from that of the locals. Villas tend to be walled off and secluded which provides some nice peace and quiet, but one step outside and you're part of the everyday buzz there. Getting from Ngurah Rai International Airport to the villa wasn’t exactly smooth. With no train or large mass transit system, there’s a group of non-meter taxi drivers that immediately swarm you for your business. The light blue Blue Bird taxi is known to be the most legit, but I mistakenly flagged down a lookalike "Blue Biro." Tricked. We ended up paying only about $5USD more, so no real harm done other than to the ego. We stayed at the Aksari Villa, between the main Jl Raya Legian and Jl Sunset roads. From the fresh coconut juice they gave at check-in until the time we checked out, service was great and they were keen on making sure everything was going well for us. There are only several rooms at the villa, each with a private pool, outdoor shower and breakfast included, it was a nice little gem to wake up and come home to. They also provide transportation and more romantic services like floating breakfasts in the pool. During the day, we explored some nearby local areas. One stop was Pasar Taman Sari market [map] which was a short taxi ride away. This is a local market where vendors are selling things from fruits and vegetables to little knick knacks, while some are chopping up chicken (already dead!). The market isn't that big, it only takes about 10 minutes to go through. Walking down Jl Raya Kerobokan street from the market, we checked out Jl Kayu Aya street, an area geared to tourists with upscale coffee shops and fashion boutiques. Prices are a little bit higher here than comparable local shops elsewhere, but there are nice spots worth stopping at like the Corner House, a coffee shop and cafe with westcoast vibes. There's also a delicious gelato shop here that I'll show below. Like I mentioned, this part of Bali is busier than you'd probably expect. Kuta is a surf and party town full of rowdy foreigners and Seminyak is its neighbor. As one taxi driver put it, "People like to come here to do what they can't do back home." The city is moped-first, and during rush hour, cars are bumper-to-bumper while mopeds weave in and out of every small crease their drivers can find. Definitely give yourself ample time to get to places, because most streets are one-lane only, and traffic here is no joke. The more relaxing, quieter locations tend to be outside of this area. People in Bali are quite nice. They're generally laid back and many of them like to engage in conversation, especially the taxi drivers. Most of the people that we encountered displayed great hospitality and tried to show us a good time. The only grouch we came across was the ticket person at Uluwatu Temple who got mad because we didn't have the exact amount of cash for tickets and needed change. 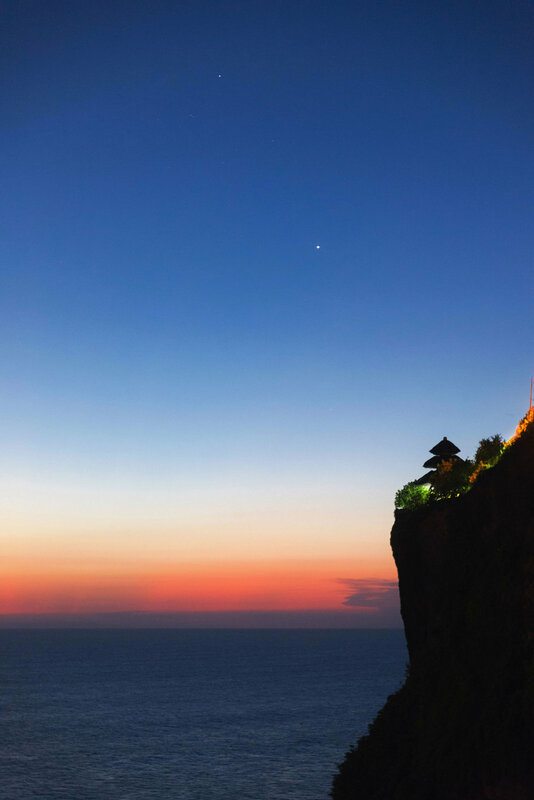 Getting to places like Uluwatu Temple can be done by taxi or by asking hotel staff to schedule transportation. From the Aksari Villa, we had a taxi driver drive us in traffic for about 2 hours to Uluwatu temple and back again. He even patiently waited for us at the temple. This is normal for them to do and you'll see a lot of drivers hanging around outside popular tourist destinations. Uluwatu Temple at sunset is an absolute must. The area hangs beautifully over a large cliff overlooking the Indian Ocean and it made me realize instantly why Bali sunsets are famous. The Kecak dance performance done on the temple grounds is really popular, but we missed the entrance due to traffic and only could catch glimpses of it from the outside. The chants, however, filled the air as the sun went down. Seminyak is a great first stop for Bali travels. 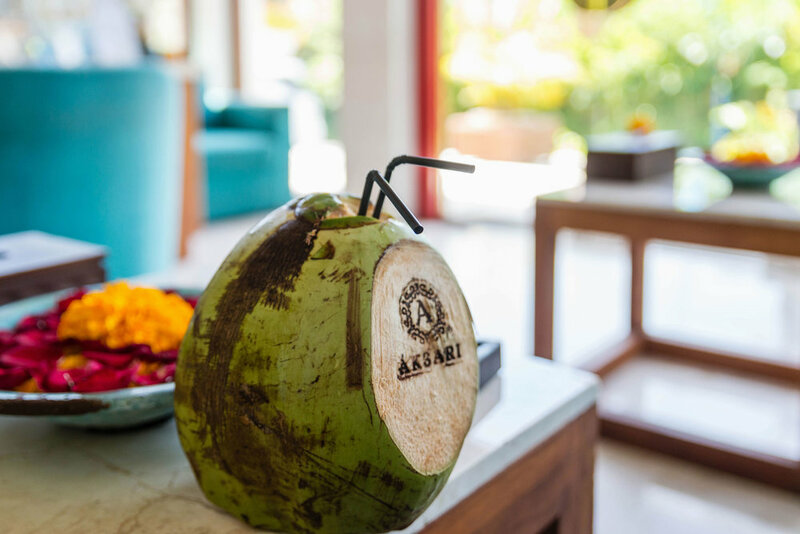 The two nights that we spent there helped us get acclimated and provided a launching pad to our next stop: Ubud. 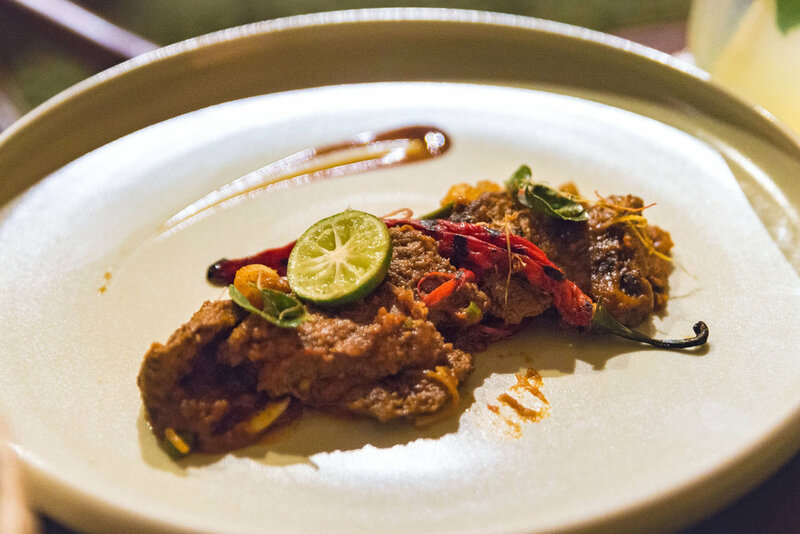 We also had some great food in Seminyak, and I'd highly recommend a few spots to anyone who visits the area. Wow. What. Is. This. That was the reaction in my head when I started eating this suckling pig, or babi guling. Traditionally for ceremonial events, babi guling is now mainstream and consists of different parts of the outdoor-roasted pig, along with mixes of spices (sambal) that become a sort of salsa. Pak Malen's was hands down the best I ate in Bali. 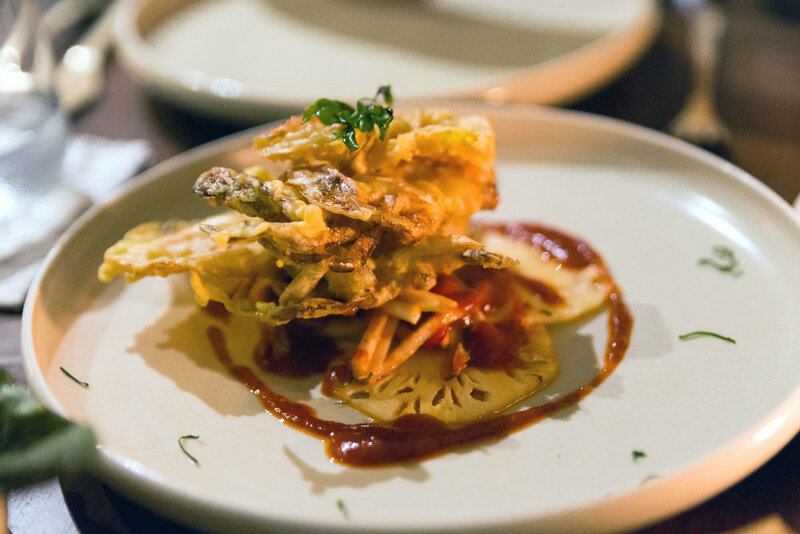 It's a hectic, local-like spot that is absolutely a must-go. Even the soup, which my amateur tongue said "chicken noodle soup with curry," was amazing. Even nicer than expected. Bambu's often on foreign residents' Bali guides and I can see why. The setting was beautiful with tables right above koi-filled water, and food was good. 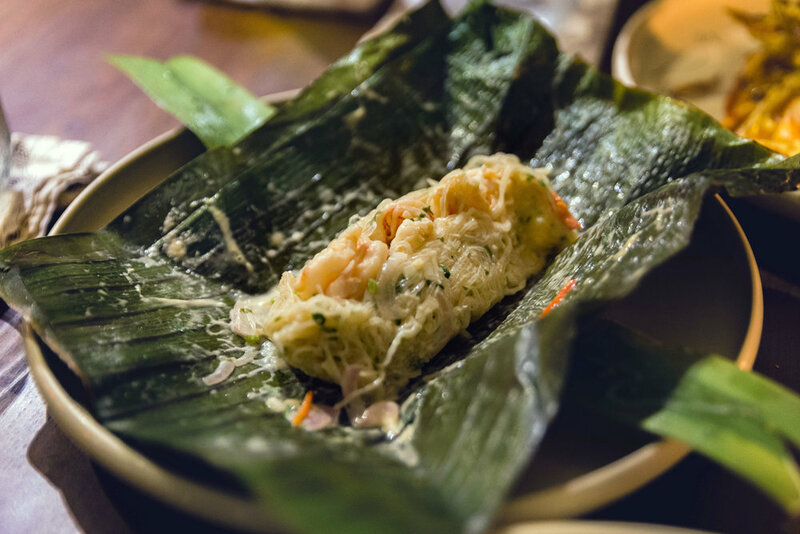 Favorites included the Bebek Betutu (slow roast duck with galangal and lemongrass, toasted coconut and green bean salad) and Udang Tim Ketumbar (Steamed prawn and glass noodles in banana leaf with coconut and coriander). While the portions were small, the entire dinner for 2 was only about $90 USD. "Gelato is always a good idea." That's on the Gelato Factory's wall and it's easy to see why. This was a nice find on Jl Kayu Aya street, an area geared to westerners and tourists. Yes, the wall decor, hanging lights and customers' Instagram posts in wood frames are cute, but the Gelato Factory backs up the show - they serve around 30 flavors of some fantastic gelato. And they're not just tasty and refreshing, they're made from local, natural ingredients and the shop even works hard to keep them all healthy.